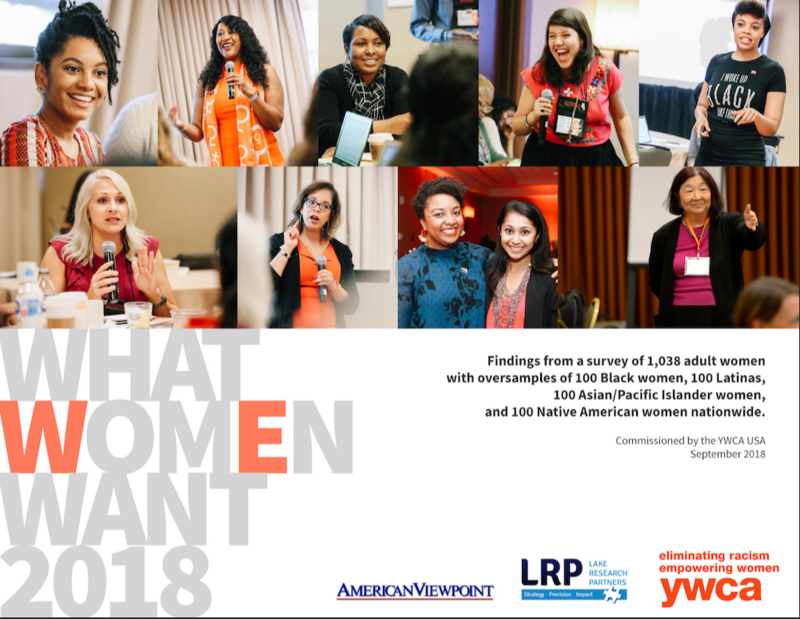 YWCA USA’s What Women Want 2018 is a new national survey of American women identifying women’s public policy priorities. View the report here. The survey is part of YWCA’s newly-launched civic engagement effort to register 10,000 women to vote before the upcoming midterm elections, and to ensure women’s issues are at the forefront of policy discussions. This survey includes an important focus on the voices of Black, Latina, Asian American, Native American, and millennial women. Help us highlight What Women Want by joining the #YWomenVote campaign on social media. Share these infographics and join the online conversation with @YWCAUSA. Learn more in the press release and view video from the official report launch event, above and watch our webinar from October 9. The report, commissioned by YWCA and led by Celinda Lake of Lake Research Partners and Linda DiVall of American Viewpoint, highlights that the lives of women — across race, age, education, and party affiliation — are deeply connected around their needs and concerns for their families and their futures.